• For quantitative determination of glutamine and evaluation of drug effects on glutamine metabolism. • Sensitive and accurate. Use 20 μL sample. Linear detection range 0.023 - 2 mM glutamine in 96-well plate assay. • Convenient. The procedure involves adding a single working reagent, incubation for 40 min at room temperature, adding a stop reagent and reading the optical density. No 37°C heater is needed. • Glutamine is an amino acid synthesized in the muscle that plays major roles in protein synthesis, acid-base balance, anabolic processes and is utilized for cellular energy and as a carbon source. It is used in treatment of injury, trauma, burns, and also as a supplement for muscle growth and post-surgery healing. Simple, direct and automation-ready procedures for measuring glutamine concentration are very desirable. BioAssay Systems EnzyChrom™ glutamine assay kit is based on hydrolysis of glutamine to glutamate and colorimetric determination of the product. The intensity of the product color, measured at 565 nm, is proportional to the glutamine concentration in the sample. 1. Does ascorbic acid interfere with the glutamine assay? Up to 125 mM ascorbic acid in the sample does not interfere significantly with the assay. Samples with higher ascorbic acid concentrations should be diluted to a final ascorbic acid concentration of 125 mM or less. Normal human serum contains around 20-60 mM ascorbic acid, which does not interfere with the assay. 2. Can I deproteinate my samples with acid? The assay is based on an enzyme based reaction and acid based deproteination procedures can often interfere with the assay. We do not recommend acid deproteination on samples with this assay. 1. Behjousiar A et al (2012). In situ monitoring of intracellular glucose and glutamine in CHO cell culture. PLoS One 7(4):e34512. 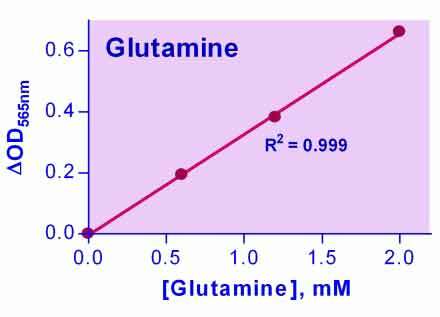 Assay: Glutamine in Hamster CHO cells (Pubmed). 2. Lin TC et al (2012). Autophagy: Resetting glutamine-dependent metabolism and oxygen consumption. Autophagy 8(10):1477-93. Assay: Glutamine in Mouse Mouse embryonic fibroblasts (Pubmed). 3. Tang N et al (2012). Stable overexpression of arginase I and ornithine transcarbamylase in HepG2 cells improves its ammonia detoxification. J Cell Biochem. 113(2):518-27. Assay: Glutamine in Human HepG2 hepatocellular carcinoma cells (Pubmed). 4. Yang LM, Blount P (2011). Manipulating the permeation of charged compounds through the MscL nanovalve. FASEB J 25(1):428-34. Assay: Glutamate in Bacteria E. Coli glutamate efflux (Pubmed). 5. Liang, Y et al (2011). Additive effect of tetramethylpyrazine and deferoxamine in the treatment of spinal cord injury caused by aortic cross-clamping in rats. Spinal Cord 49(2):302-6. Assay: Glutamate in Rat tissue (Pubmed). 6. Rink, C et al (2011). Oxygen-inducible glutamate oxaloacetate transaminase as protective switch transforming neurotoxic glutamate to metabolic fuel during acute ischemic stroke. Antioxid Redox Signal 14(10):1777-85. Assay: Glutamate in Rat Brain tissue (Pubmed). 7. Zhul, MN et al (2014). Effects of oral glutamine supplementation on exercise-induced gastrointestinal permeability and tight junction protein expression. Journal of Applied Physiology. 116(2):183-191. Assay: Intestinal Tissue in Humans (Pubmed). 8. Zhang. M et al (2014), Oral cancer cells may rewire alternative metabolic pathways to survive from siRNA silencing of metabolic enzymes. BMC Cancer 14:223. Assay: Oral Keratinocytes in Humans (Pubmed). 9. Behari, J et al (2014) b-Catenin Links Hepatic Metabolic Zonation with Lipid Metabolism and Diet-Induced Obesity in Mice. The American Journal of Pathology. 184:12. Assay: Liver Cells in Mice (Pubmed).